The library is now investing in providing better service to researchers. Johanna Nählinder is herself a researcher and knows exactly the help that researchers require. She is now available as a resource in the library. “I bring a researcher perspective to library work,” she says. The library has long offered aid to research students and researchers, and has now decided to upgrade and expand the service. 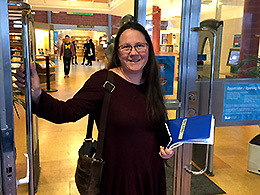 Johanna Nählinder took a doctor’s degree in 2005 at the Department of Thematic Studies – Technology and Social Change, and has subsequently pursued a research career at LiU, initially within political science and then industrial organisation. Her own experiences as research student and researcher have made her aware how easy it is to just follow old routines, and fail to keep up-to-date in, for example, information search, data management, external monitoring, copyright issues and publishing. One important part of her work is to help disseminate all the knowledge that is created within the university. Her goal is to increase the citation frequency of LiU researchers, which requires that they publish in highly ranked journals. In her newly created post at the library, Johanna Nählinder will, for example, help researchers to find high-quality scientific journals to publish in, and encourage them not to be satisfied with publication in poorly ranked journals. She can also help the articles to reach the readers. “There are some clever strategies to follow if you want to reach the best journals, and many are not currently using them. Johanna Nählinder is also on twitter, where she can answer researcher questions: @JohnaLiUB. She is happy come out and talk to research students and researchers, either to individuals or to groups, about questions that arise as the work proceeds. Johanna Nählinder can be reached at johanna.nahlinder@liu.se. Tel. : (013) 282903 or 070 089 6437.